QUESTION: Do language and currencies move in line with each other? Is language a leading indicator to currency i.e. Spanish in California. Will they create their own currency if they separate from the states? ANSWER: There is a direct link between currency and language. When I was doing interviews in Europe, I explained the euro would fail because Europe lacked a single language. I laid out the example of the United States, for it became the melting pot in all reality. The key was not a single currency in the USA that made the dollar dominant, but a single language. The same was true of the Roman Empire. It was the language that created the empire because everyone could intermarry and communicate, which resulted in an economic boom. 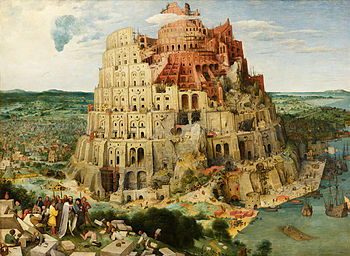 1.Now the whole world had one language and a common speech. As people moved eastward, they found a plain in Shinar and settled there. In the USA, if you ask an American what are they, they will respond, “Half Irish and half German” or whatever. All the Europeans intermarried in the USA because they spoke the same language. In Europe, an intermarriage between a German and Irish is the exception — not common in the least. Europe could not be united simply by a currency. Hispanics have migrated to the USA from Latin America, but the majority have retained their language. That has defeated the melting pot. In California, 44% of the population over five years of age speak something other than English, and therein lies the demise of California. Refusing to adopt the language of the nation you migrate to ultimately means you are refusing to adopt that culture. If that subculture then becomes the majority, the culture of the state will change and therein lies the seed to breaking the bonds that would link California to the rest of the nation. California became a state on September 9, 1850. The very latest California would separate and become its own country would be in 2074. The beginning of separation was targeted for 2004, which was 50% of the 309.6-year ECM cycle. Right on target, following the 2003 gubernatorial recall, Tim Holt and Martin Hutchinson proposed in newspaper op-eds that the state should split into as many as four new states. They argued for dividing California into distinct geographically and politically defined regions as the Bay Area, North Coast, and Central Valley, as well as the historic Shasta/Jefferson region. Each proposed they should be separate states due to culture. Then on December 19, 2013, venture capitalist Tim Draper submitted a six-page proposal calling for California to be broken up into six new states. The California secession movement has picked up steam with the election of Donald Trump. California will separate into its own country after 2032. However, the pressure to split the state itself is also on the rise. This is certainly being fueled by the language differences that go hand-in-hand with culture. « Do the Democrats Hold an Anti-Religion Position?